UPDATE 12/27/2016: We raised over $1000 for food-insecure children! Way to go! For the month of December, we want to empower patrons of PaperRater to make a difference in the world of someone in need while improving your writing. So today we are announcing a partnership with GO Pantry, a charity that feeds needy children who slip through the cracks of other social institutions and programs within the United States. Schools do a fabulous job of feeding children who are food-insecure via free or reduced lunch programs, but what about weekends and the summer? The sad reality is that many of the most at risk children go without food for extended periods of time when school is not in session. Through food drives, corporate sponsors, volunteers, and charitable individuals, GO Pantry sends "GO Boxes" and "GO Bags" full of food to children identified by their school as being the most at risk. If you've been on the fence about signing up for PaperRater, now is the best time to join! 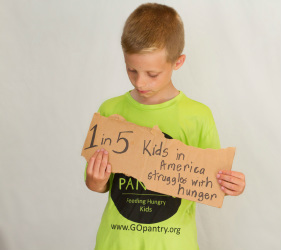 For every new subscriber in December, we will donate $5 to GO Pantry. Imagine the smiles that you put on the faces of children in need. What could be better than that?